An unconditional Guarantee of Quality is offered on everything we do, with a full money-back refund if you are not satisfied. Please feel free to get in touch with any queries, normal working hours are 9am to 5.30pm, but often a little earlier and a little later too. Treat your pets to the best from an established, experienced and caring business providing a friendly, qualified service. Now into the tenth year in Bethersden, Kent, serving Ashford, Tenterden and surrounding villages. 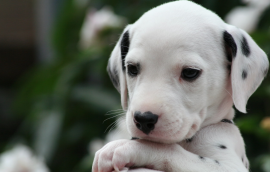 Emma and her team would love to see your new puppy and help them to get used to being groomed. So we are offering an introductory offer of 25% off your puppy’s first groom. 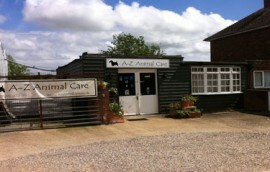 Your pets will be cared for in the very well equipped grooming centre at Bethersden, Kent. There is a reception area with seating, preparation & bathing areas, and a finishing room for clipping and styling. For your pet’s safety and well-being the team is led by Emma Betts, a Qualified Veterinary Nurse listed at The Royal College of Veterinary Surgeons, (RCVS) with over 20 years experience of caring for animals. Alfie & my first trip to A-Z was warm & friendly. I was / am very pleased with the groom and how my boy was looked after! Bearing in mind he is quite nervous. I would recommend your service. We have had our dog groomed twice and many people have commented on our “handsome dog” all due to your 5 star rating. It was my first time taking Sephy to a groomers and we were both a little nervous, but the staff were lovely and friendly. Sephy looks great and we will definitely be back. Thank you very much. Superb service. Friendly and caring staff. Will definitely be back. Very pleased with Mollies cut & blow dry! Meow! Thank you for shaving off my fur, as you can imagine it was quite uncomfortable with all that matting. Also thanks for doing my nails & ears! My mummy gave me lots of love and cuddles when we got home and although I look silly I know its best! Thank you! Purrs & Meows. Boris looked fantastic! Very happy. My little Pippa looks beautiful, thank you. Great job again! First time I had used A-Z service and happy with service provided. Will be in contact again when required & will recommend service to friends with animals. Dear all at A-Z. Thank you for again making Dicken a more comfortable cat. He has been sleeping well since he got home. Thank you for excellent service. I was really anxious about having Rufus groomed. But I needn’t have been. He was a happy boy, lovely girls, so friendly. We’ve booked again and thank you. Many thanks for the excellent job you did on our two dogs, Sally and Shadow. Will contact you early in October for their Autumn bath and tidy up. For your pet's continued safety and care all staff are trained in First Aid, Animal First Aid, plus Health, Safety & Security, with regular refreshers. 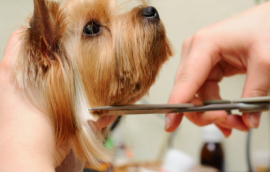 The British Dog Groomers Association and Pet Care Trust promote the highest standards of grooming and animal care. As full and continuous members since 2005 A-Z Animal Care continually strive to meet, and where possible, better these standards. You can park right outside with just a few paces to the entrance and right next door, in the attached garden centre, there is a pet shop and a café serving refreshments and light meals if you need to wait. Licensed Dog, Cat and Horse Wormers, Frontline Flea treatments and a range of grooming products including shampoos, conditioners and grooming equipment are all available at reasonable prices.